Gerard Senehi’s not telling, though. 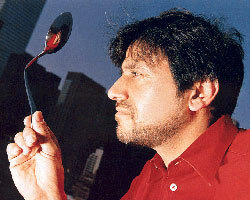 The secret of this and his other trademark magic feats – moving objects through the air, mindreading – remain locked inside his head. 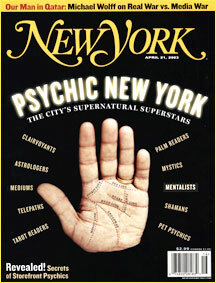 So unless you can read the 44-year-old mentalist’s mind, you’re out of luck. Which is a good thing for Senehi. Unlike traditional magicians, who employ props and sleight of hand to wring “miracles” out of thin air, mentalists – or mind magicians – use skills like hypnosis and memory as tools of their trade. Using items that clearly aren’t props, like Philbin’s wineglass or utensil, boosts the audience’s amazement factor. With magicians, the audience generally assumes the rabbit trick is, well, a trick. Calling himself the “Experimentalist,” says Senehi seems more scientific than magical. He doesn’t use Atlantic City patter or gimmicks, either, to distract the audience from what he’s really doing; Senehi wants you to think about the tricks he does. And to question the laws of physics. Senehi discovered this ability while attending Les Mioches boarding school in Switzerland. While reading a friend’s blackjack cards, he was able to draw and accurately predict four cards in a row. “I was interested in questions I could not answer, and was fascinated by puzzles.” he remembers. “On the surface, you couldn’t figure magic out, but when you went deeper, you could.” Senehi, however, was not mechanically inclined and recalls taking watches apart but not being able to put them back together. So digging deeper took a bit more effort. Now, of course, he can alter watches mentally. One of his favorite tricks is to change the time on a watch without seeming to touch it. Born in Paris, Senehi studied in Switzerland before going off to Amherst College in western Massachusetts. After earning a B.A. in psychology and then a master’s in psychological education he spent years working as a graphic designer and a social worker. Five years ago, he visited a friend in Israel, where he decided to pursue his dream of becoming a mentalist. Senehi started by bending coins, but honed the craft so well that after two years of street performing in Israel, he returned to the United States. Today, the unmarried mentalist lives in Lenox, Massachusetts, and earns a more than respectable living performing for a wide range of events, from corporate affairs for investment banks like Merrill Lynch to top social functions on someone’s private island. His quiet nature translates to “mysterious” onstage where Senehi usually has the audience eating out of the palm of his hand by the time he takes his last bow. In fact he often has to pry himself away from an awed crowd who poly him with countless questions about his skill. The last part is what really keeps him going, however. “I like to see people shift from disbelief to belief,” he says. Still, when the party’s over, and the last audience member has gone, he’s the guy standing a lone in the hall, seeming to blend into the scenery. If you blink, perhaps he, too, might just disappear.